Feature Tennisnogo hive are two opposite inclined walls the distance between which decreases towards the bottom. Due to the inclined walls of the bees honeycomb attached to them, taking them for the bottom of the hive. The effect of the inclined walls was opened in Greece, for this reason Kiniski hive is sometimes called the Greek. 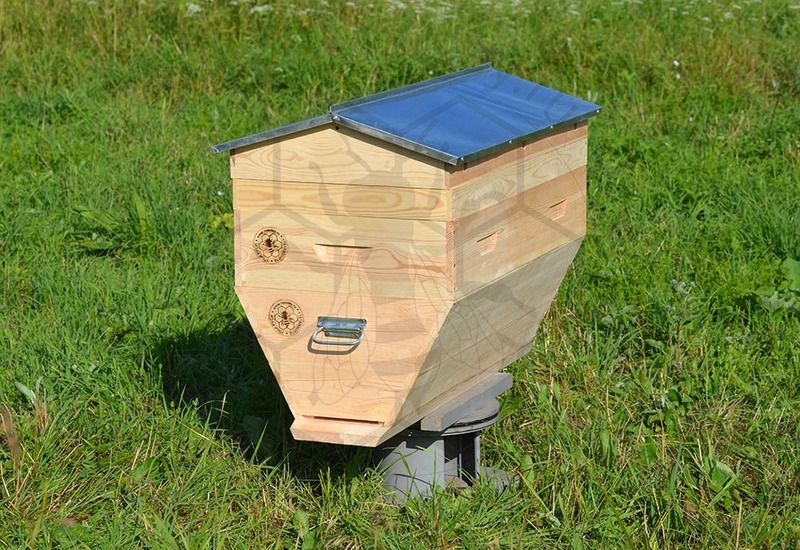 Kenyan hive allows you to start beekeeping or to expand the apiary with a minimum amount of labor and resources. To populate the hive wax is not required, it is enough to apply a thin layer of melted wax along the ridges of the strips, or pour the wax into the grooves of the slats, depending on the type bars. Beehive for 24 top bars and 24 Dadan 435*145mm frames. gabled roof with galvanised steel. Hive made of dry softwood , wall thickness 35 mm, in the walls of the board spliced in width tongue and groove, angular matching with double quarter. Entrances on opposite sides allows include 2 bee families, and take advantage of the reversal of the hive. Addition components for this hive you can order top bars, dividing partition, stand.